A few days back I received the first Coral Watch newsletter from Coral Watch with a personal note from Chris. It reminds me somehow that I haven’t done any coral monitoring since I received the kit from CW. It’s been over a year when I signed up as a volunteer and I remembered I was too ecstatic when I got the kit, grateful that it was for real and I am entrusted with some noble task for the underwater life. I shared the materials with my dive buddy so he could also impart to marine enthusiasts the great idea of monitoring the corals in our local waters. In a sense I felt guilty that I haven’t started my share in doing this formidable task. Secondly, I havent decided yet which strategic spot should I do my monitoring as it is necessary I would be frequently visiting the area. Well, I need to stop and rethink about putting in order my plan so I could start my task soon. To date, there are 1,741 surveys and 31,284 corals surveyed, hoping that more will be added in the next months. Just as the year is about to end, I’m organizing my 2011 plans. Now, I have identified to position my monitoring in Sohoton waters – being a favorite place and where preservation for sustainable marine resources is one of the community’s agenda. I’m sure it wouldn’t be too strange for them to assist and support me with this endeavor, the site would be perfect as I frequetly visiting, there will be continuity of monitoring. 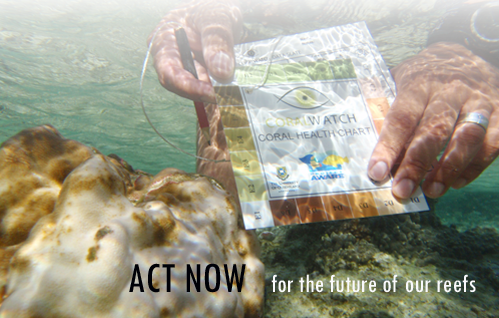 Mainly it would be monitoring of coral bleaching and assessment of coral health. I need to join the force of people who have great concern for the marine world before global warming can overtake us. I can’t wait to start this! I have something worthwhile to waste my time with when I go snorkeling, I can bring my diving and water escapades to another level. In my own way, I can spread the word albeit slowly but surely and let others be educated, passionate and involved in reef health monitoring. My love for marine life could never be limited by just watching in awe and scribbling on my log describing wonderful experiences, there is something more! I need to roll up my sleeves for my second home and friends. I can’t help to be bullish that we can restore our threatened environment before it will be too late!